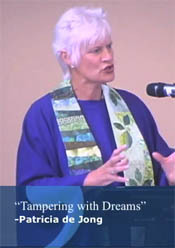 In her sermon “Tampering with Dreams”, Senior Minister Patricia de Jong weaves together the legacy of Dr. Martin Luther King, Jr., and the March on Washington with the story of Moses and the burning bush. Below are some excerpts from her sermon. Watch a video of the whole sermon. Watch Phil Porter’s telling of the story of Moses and the burning bush. We need, this morning to be awed and yet cautious, just as Moses was when he saw the burning bush. We stand in awe; so much has been pursued in the cause for justice since that day. Following the March on Washington, people got to work and began to carve a way out of no way for American Blacks in the South. The Southern Leadership Conference got busy and so did all the people around Dr King. Racial injustice was challenged at every turn and broken open through the courageous acts of hundreds and thousands of people who refused to tolerate hatred and violence. Dr. King’ lasting legacy and dream is not only for Americans, but for all people who have had to fight their way out of fear, violence and inequality. We see his image today in the eyes of those freedom fighters in Egypt, Libya and Syria and in the hearts of people everywhere who understand what it means for the human heart and spirit to be trampled upon and held down because of repressive regimes, hostile dictators, and those who promote hatred instead of love and war instead of peace. And we see him in those who have dedicated their lives to creating justice, compassion and freedom throughout the world. We as Progressive Christians are called to continue to press for love, justice and compassion in a culture that is threatened at its most vulnerable points. In our times, the burning bush is the call of an awesome and holy God who demands active and lively partners in the quest for a better and more just nation. Many Americans are out of work and unemployment stands in the double digits. While the weathier are getting wealthier, the poor staying poor, those we are in between are disappearing. Our prisons are filled with young men who cannot find their way in this society, who end up making a way to prison. Our universities are training people for jobs that may not exist upon graduation for some men and women. We have an African American president, but that does not mean that we have achieved racial equality or that he is free from attacks which have occasionally been about his race rather than his record. We are living in a time when some Americans are less tolerant of the differences between us rather than more tolerant, caring and forgiving. Someone has been tampering with the dream that all of us in this nation have the chance for a just and equal existence.